Feelin' Mo' Kenyan: I could use... a little more cowbell !! 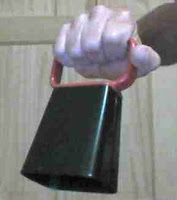 I could use... a little more cowbell !! "Man, we need a decent cowbell!" Yeah, some races pass out those dinky, party favor type cheap-o ones, but I wanted something that racers can actually hear! Well, this one off Amazon for $13 bucks (and free shipping) does the trick! It passed the indoor, 'make the dog run for cover' test. Paige said it hurt her ears. ps: If you've never seen the SNL skit, then you must watch. My Most Nervous Race - EVER!